I had all these titles in mind, and nothing stood out. It all seemed forced. It all seems, well, suited for another time. In a way I’m working backwards and forwards, and it’s a continuation of something I spoke of two weeks ago. There’s going to be a point where my love for Annapolis (and my love affair can be found here) is going to sound repetitive, and all the phrases and connotations are going feel trite. I’m hoping I’m nowhere close to that point. Because this is a good one. This was an interesting day, that takes me a few weeks ago, to where I was in a vulnerable and confused place. I was in a state of shock and numbness that I had never felt before. It was a sense of relief, peace, and forthcoming (still waiting…) rejuvenation. Maybe. When I’m feeling the blues or anything uncomfortable, the natural inclination is to hide under whatever I can for as long as I need to, as in a way to stamp out that feeling. That works every once in a while. That feeling is going to be there, so why not make the most of things. So I got in the car and just went with a sense I would head to Naptown, literally to buy some tea and maybe get some fresh air. That did happen, but who knew this would become a marathon like afternoon that turned into evening, that I will always remember with every emotion ever created. Even if I never wrote about this particular day, it’s going to stick with me. Some things age well and resonate with you because the memories are amazing. This one tells a story that I’m torn on now, but it got better as I say I’m torn, and it’s becoming the night out of all nights out that I’ll look back so fondly on. And it was all on my own. I’ll leave a lot of the places out, because I’ll revisit those another day. But I did a lot of wandering, and discovered some unfamiliar places that may be considered home sometime. It’s good to go to places where you feel like you belong. That’s what most of us are wanting. Yet, that belonging first comes from within. Annapolis has that aura about it. If you hang around long enough (and maybe not even that long) you’re going to know everyone and they’re going to know you. That’s a powerful thing, can be a dangerous thing, but can be the most beautiful thing. It’s a place I always called home. And I have several fond family memories of our state capital, going back to childhood. More come to mind as I write this. While I’ve made so many new ones with so many new amazing friends, and people I consider family. This one is just for me. And anyone who reads this. Fox’s Den is what I thought was a hidden gem in the heart of Main Street. Well there’s a lot of hearts of Main, but that should go without saying. 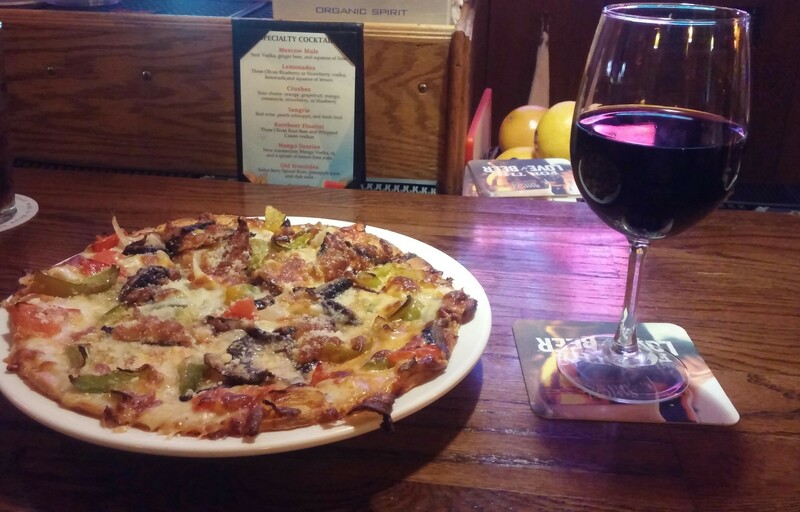 Back in January, I was all set to do a review of a wine and pizza experience here, but it was packed with state officials, and instead of faking it till we made it, we were shown the door. A few days later, it was a typical crowded happy hour, but it didn’t feel right. Not even close. 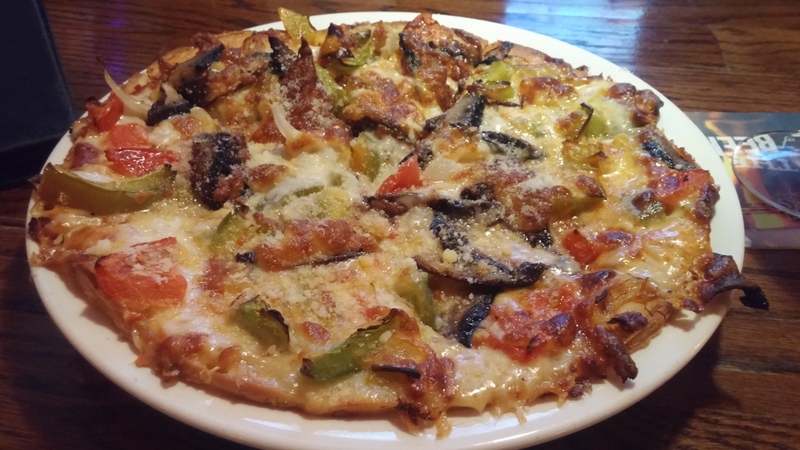 I was told the pizza here is fabulous, and it absolutely is (here is their menu,their story, and contact information); it had the most comforting wood-fired crust, that remind me of many meals with family. It had a familiarity that I’m sure many of us can relate to. I ordered a half pepperoni & pepperoncini, and half cheese. I figured basics was first, before I went any further. Those piece of pepperoni are absolutely divine. What else is there to say? This is a pizza eaters pizza. When I was told what pies to get, this was one of the stronger recommendations from dear friends who have visited, and from Ryan who was working behind the bar, who has a big help and could not be more hospitable. Thanks so much. The pie worked perfectly with the wine I chose. I forgot the grape, but it doesn’t matter. None of the details matter. I did randomly meet some people at the bar, and throughout the day, people were just talking to me. I wasn’t looking for it, I wasn’t looking for anything really, and that’s how it usually goes. I was content and at peace with myself. To go, Ryan suggested the El Matador, and it’s another gem. The chorizo, feta, provolone, olives, and honey combination sounds like a lot, but the medley works beyond belief and beyond comprehension. And that dough, my goodness. This is one of the best heated pizzas I can ever remember. I almost write this in a way that takes away from the pizza. This day was about a lot of things, and a lot of emotions. I felt like I was carrying the weight of the universe, but the universe carried me and protected me from what I was feeling. The amount of walking and thinking I did along this beautiful town, through the historic streets, the majestic buildings and colonial architecture hopefully burned off all this yummy food. But it didn’t matter. It’s a day that even as I write this, can’t be completely captured in words. I’m glad I got this in before this coming Father’s Day. I only realize this now, as I took a couple of weeks off to relax, find peace, and well keep trying to find peace. This town, officially felt like my town, but that wasn’t the intent. I was born in one place, that’s also home, but this to me made it official. Annapolis has always had my heart, but this experience was beyond romantic. It’s on that kindred spirit level. I just don’t know, but I know someone out there, a spirit bigger than me, and bigger than us, is telling me everything is going to be ok.
After a delay and hopefully a lot of patience, the Fells Point Fun Festival commences this weekend. My sincerest hope is that we get some good weather and that the original postponement won’t hinder folks from coming down in the usual masses that we are accustomed to. And the hope is that local businesses and vendors get some great exposure and boost their bottom lines. Many deserve it and many are fantastic people. 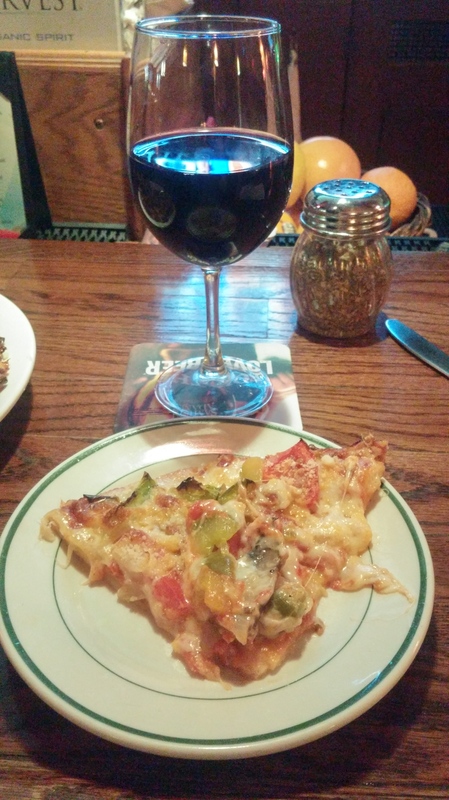 Speaking of fantastic, it’s my pleasure to write about what could be my last neighborhood pizza review for the calendar year. A few extra weeks have been fun and I hope I’ve been able to capture some of the essence of this place of wonder and joy. Ale Mary’s is the quintessential neighborhood bar. It’s a haunt that I wish I frequented more often. The set-up, ambiance, and dim lights are right up mine and many others’ alley. The times I’ve eaten here have always been pleasant. It’s great bar food that doesn’t pretend to be anything overly pretentious or unapproachable. And more times than not, that’s all we want. It’s just close enough to the commotion and heart of Fells Point, while also a safe house for many that want to avoid that. It’s the perfect balance and especially for this weekend, the perfect pizza. I was in here over a month ago, and when examining the menu, I never realized they served pizza. 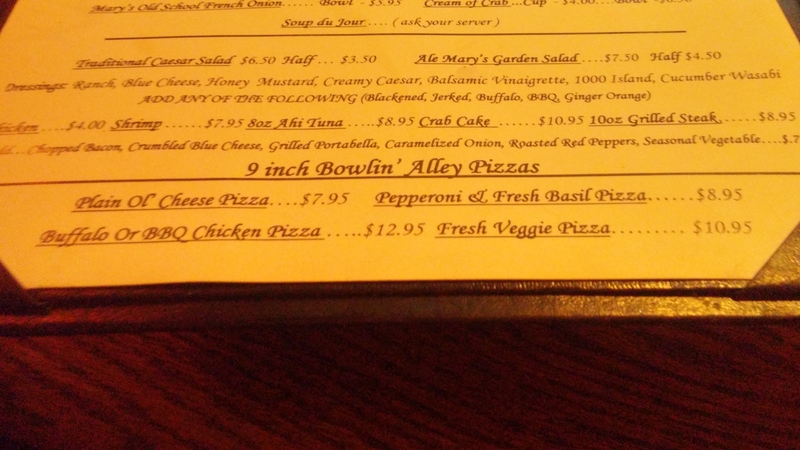 Even better, they tout it as personal Bowlin’ Alley Pizzas. An instant light bulb and cheesy television theme music went off in my head. I had to come back and try a pie! 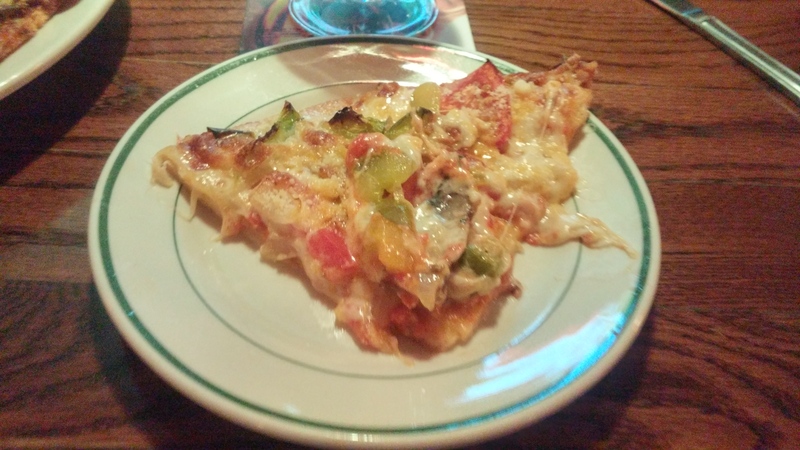 The very likeable bartender suggested the Fresh Veggie with mushrooms added on. How could I say no to that? I had no idea that there’s parmesan already thrown on top of the pie. 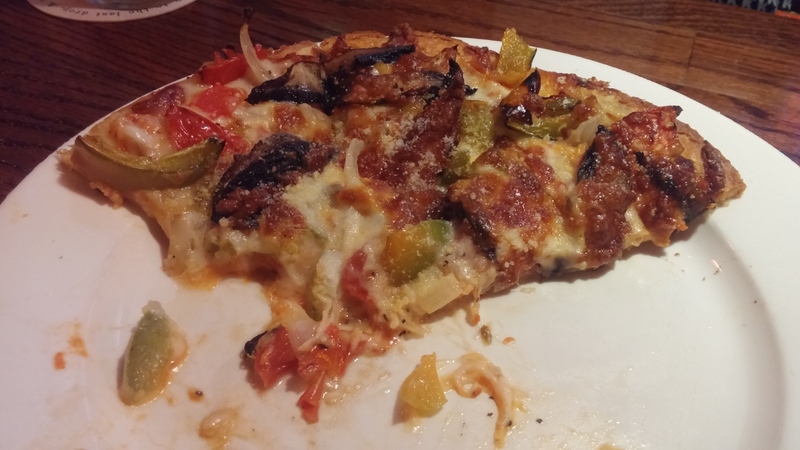 And with all the vegetables piled on, it was a splendid addition that enhanced the flavor of my pizza and the vegetables. This is a piece of information I was pleased to discover. The crust was so crisp and so crunchy, that I had to slow myself down and appreciate what I was having. The melange of cheese, sauce, and the veggies makes this such a charmer. This is a really fun pizza. I don’t remember what bowling alley pizza tastes like or is supposed to taste like. I don’t recall the last time I’ve had pizza at a bowling alley, if ever. I don’t have that to compare it too, but I do know that this was so enjoyable, I could have had another. This pie was decimated in minutes. And as always, it paired well my vino. 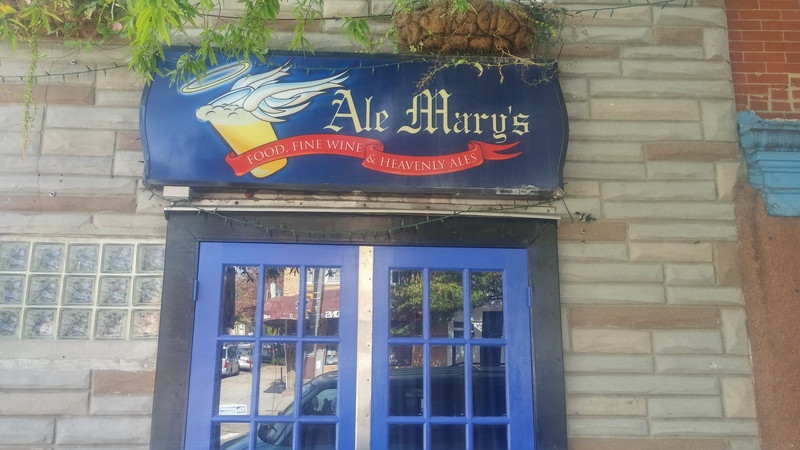 I’m grateful to have Ale Mary’s as my day of festival post and highly recommend checking them out if you’re in the neighborhood this weekend and looking to venture outside the chaos at Broadway and Thames. The regulars, who always seem so friendly, don’t need to be sold. They’ve appreciated their visits time and time again. This may be the penultimate post for the neighborhood this year or this might be it. I do have one more place in mind that I really want to talk about. I hope and aspire to get to it. I’ve really enjoyed visiting some new places, giving some old ones their just due (or justified critiques), and enhancing my love for one of the greatest places I’ve ever had the pleasure of seeing. Hope to see you this weekend on the cobblestone streets of Fells!